I’ve been spending a lot of time recently looking at marketing measurement systems. This means that you, Dear Reader, will be spending a lot of time reading about them. A good place to start is Marketing Management Analytics, known to its friends as MMA. MMA was founded in 1989 and is one of the pioneers in marketing mix modeling. Mix models remain the heart of the company’s business. But while traditional mix models look at direct correlations between advertising and sales, MMA’s current approach takes a more layered view. This includes what the company calls “multistage” attribution, which looks at intermediate touchpoints between an advertisement and the final purchase, and “customer cascade analysis”, which measures the long-term impact of advertisements on brand equity. The company has also beefed up its consulting services to help make its findings more actionable. MMA’s foray into attribution is intriguing, since it puts the company into some degree of competition with attribution specialists like VisualIQ, Adometry, and ClearSaleing. But MMA works with aggregate data such as total spend and impressions, with a major emphasis on mass media like television. Those other vendors work primarily with data about individual buyers, which comes largely from digital and direct media. MMA's clients are traditional mass media advertisers, in consumer packaged goods, automotive, financial services, retail, pharmaceuticals, and communications, and it is working for CMOs who are allocating budgets across channels. The other vendors' clients are concentrated in ecommerce and they are answering more tactical questions about spending within the digital channels. What they all share is the goal of measuring the incremental impact of expenditures in specific media. MMA recently released the latest version of its flagship software, Avista. The system is still focused on traditional marketing mix models, although it can incorporate the "multistage" approach of measuring the impact of one channel on another. The new release, Avista 8, was designed to make it easier for marketers and media planners work directly with the system, rather than relying on technical experts. The main interface displays curves that represent the relationship between spending on each tactic and final sales. Marketers use sliders to adjust the spending levels and the system then estimates the sales that would result. Avista can also run optimization routines to automatically find the most effective spending mix. Users can limit how much spending on any one tactic can increase or decrease, can create groups of tactics that draw from a shared budget, and can choose the target of the optimization (maximum profit with a given budget, minimum spend to reach a target revenue level, etc.). 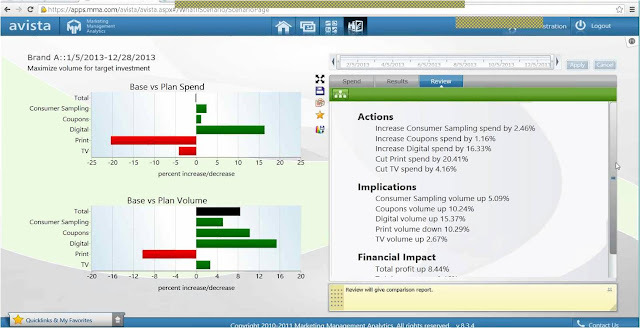 Outputs can show details by brand, product, region, sales channel and time period. Users can save scenarios and compare them to each other. Once they’ve chosen a scenario, Avista can convert it to a high-level media plan for buyers to execute. The system also has a forecasting feature that runs the same models but also lets users change assumptions about factors other than marketing spend, such as weather, competitive behavior, and distribution channels. 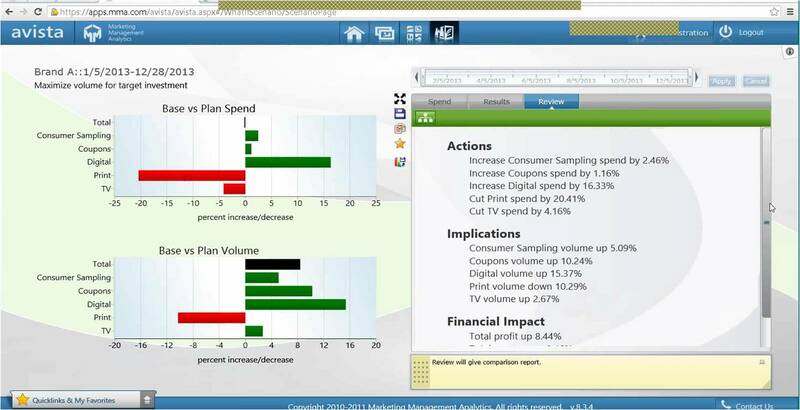 Results can be displayed on reports, which in turn can be assembled into custom dashboards. MMA also offers its clients a data access tool called MarketView, which lets them view and lightly analyze the data assembled as model inputs. This is a popular service by itself, because model inputs often include data the marketers have never seen before. Giving them early access helps to speed the modeling process by letting them verify the quality of the data. Infusionsoft today announced it has acquired social lead generation vendor GroSocial. 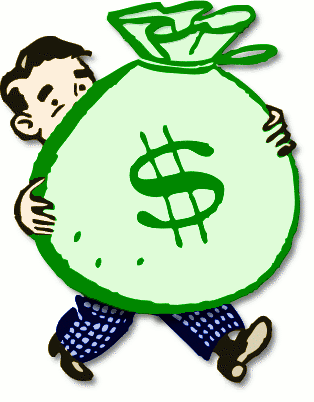 This comes two weeks after Infusionsoft raised $54 million in new funding. Still, the $54 million investment is the more interesting story. The sheer amount is impressive; previous funding for Infusionsoft totaled just $17 million. According to CEO Clate Mask, most of the money will be used for acquisitions, product development, and accelerated customer acquisition. He said that the new funds will let Infusionsoft grow at about the same 53% pace as last year, compared with the 45% or so they had planned to grow otherwise. The investment can be read as validation of Infusionsoft’s strategy of offering unified marketing automation, CRM, and ecommerce exclusively for very small businesses. But that isn’t necessary: the strategy is already validated by Infusionsoft's continued growth, with 2012 revenues of $39 million and plans to triple its employee base to 1,000 in the next three years. I think it's more useful to learn from Infusionsoft’s experiments with deployment models. The company has alternated between charging an implementation fee and not charging for it – and determined that a paid fee, and the more extensive hand-holding this permits, is more effective at building a long-term business. Implementation services go beyond training to actually setting up initial marketing programs. Naturally, Infusionsoft still strives to make its system as easy as possible to use, but its experience shows that new clients still need extensive help. This conclusion may strike you as obvious. But there is, at least implicitly, a continued debate within the marketing automation industry between vendors who believe that they can make systems smart enough for new users to run without help, and those who believe human support remains essential. The “smart systems” group aims to build sophisticated technology that can automatically gather information, identify the best response, create the appropriate programs, and present them to marketer for approval. The “human support” group believes this level of automation isn’t practical or desirable, and instead focuses on building service organizations to train marketers and, when necessary, do the work for them. Both groups are rejecting the belief that marketing automation systems can be made simple enough for marketers to do the work themselves with either automated or human help. That third theory – let’s call it the “ease of use” school – has been the dominant approach of the B2B marketing automation industry for the past few years. I’m tempted to say it has failed, and to cite the well-known statistics showing how few marketers use their systems fully. * But “failure” seems a harsh term for an industry growing at 50% per year. Still, there’s a shared sense among industry vendors that there’s a critical shortage of marketers able to use marketing automation tools effectively and that this is limiting industry growth. I increasingly see companies following the other two theories – smarter systems or greater human support – as a way to overcome this. Infusionsoft’s approach is part of this trend. I myself have always been partial to the "smart systems" approach. But that may be just because I like technology. It's certainly true that more companies are following the human services strategy and reporting good success. Of course, the services strategy is easier to execute: you just hire some sort people, who are admittedly rare but still easier to find the magical marketing robots. This makes the strategy more appropriate for small marketing automation vendors who can't afford huge technology investments. Bigger companies are attracted to the technology-based approach because it lets them limit their services staff, which makes them more attractive to investors. The big companies can also hedge their bets by building up partner networks to provide services. So the jury is still out on which approach will prevail -- but I do think that "ease of use" by itself is no longer in contention. *Actually, I have trouble laying my hands on the actual statistics. Only study I can find is from Loopfuse in 2011, which found just under 30% of marketing automation users do lead scoring. But I’m pretty sure there are others. Interact's concept is the same as other interaction managers: touchpoints send it data about a current interaction; the system uses rules, models and data to select one or more offers; and the offers are sent back to the touchpoint for delivery. The differences among these systems are matters of nuance: Interact stores its own permanent customer profiles, while some other systems must re-load data from external systems during each interaction. Interact assigns fixed scores to offers within each segment definitions, while other systems use scoring formulas shared across segments (although Interact can do that too). Interact can create self-training predictive models, not all competitors have this option. You might think that Interact plays a central role in IBM’s marketing ecosystem: after all, real-time interactions are the epitome of data-driven marketing. But just a tiny fraction of IBM’s 2,500 EMM customers use Interact (actual figures are confidential) and most deployments seem to be focused on specific -- dare I say tactical? -- applications in one or two channels. The company’s EMM focus seems to be more on analytics and outbound marketing: for example, its most recent EMM acquisitions were Tealeaf Technology (Web experience analysis) and DemandTec (merchandising analysis) . But it does report increasing interest in Interact among its clients, and high hopes for future growth. Marketing measurement is a perennially popular topic. I myself have just completed a white paper on Top Five Metrics for Revenue Generation Marketers, sponsored by LeadMD, and touched on it in a separate Gleanster study, Revenue Performance Management - The Evolution of Marketing Automation. With both of these on my mind, I also paid new attention to Eloqua’s list of five key revenue performance indicators (listed in the ‘Take a tour’ graphic on this page). The obvious question was whether these three sources agreed about what’s important. The only item that’s clearly shared across all three lists is the number of leads generated, and even that takes a bit of squinting to include Eloqua’s measure of “reach”, which is really the number of leads currently at different stages. You could also argue that close rate and conversion rates are pretty much the same thing, and therefore also present on all three lists. (Again, a bit of squinting is required). Three of the other items appear just twice (return on investment, revenue, and time to close). The remaining three occur just once. The other two lists are prescriptive: that is, they show what an expert feels should be done, not what marketers actually do. Look closely, and you'll see that the lists are quite similar. Four of the five measures are shared. Even the two non-matching items are related: my fifth item is cost and Eloqua's is return, which is a combination of cost and revenue. The apparent difference between the lists is that mine looks more simplistic. 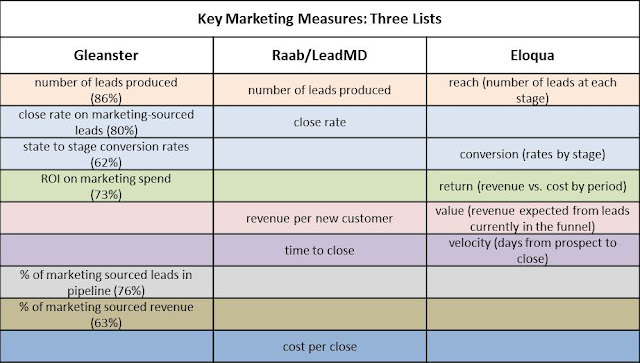 It starts with a three-part formula for calculating revenue: (number of leads) x (close rate) x (revenue per closed lead). A fourth factor, cost, combines with revenue to create return on investment. The fifth factor, time, is needed to forecast revenue by period. Eloqua’s list breaks those same factors down by stages. That is, instead of a single close rate is has a set of conversion rates from one stage to the next. 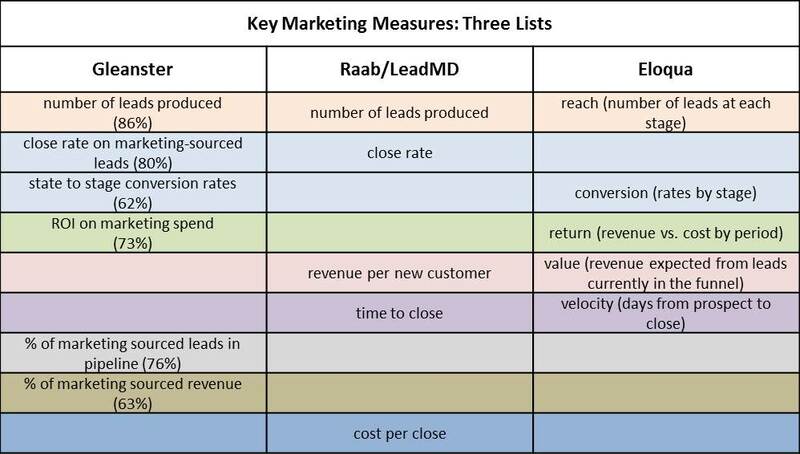 It similarly breaks number of leads into reach (number of leads at each stage), revenue into value (expected revenue from leads at each stage), and time into velocity (number of days spent at each stage). This makes total sense, and if you read my paper, you’ll see that I recommend breaking the measures into stages in almost exactly the same way. * The reason is that reporting on stages gives much greater insight into what’s working well or poorly, and thus helps marketers to see where they should make changes. Providing this sort of actionable information is probably the most important purpose for any measurement system. In short, Eloqua and I pretty much agree on what marketers should measure. Now if the marketers themselves would join the consensus. * The paper also gives plenty of sage advice on how to actually build a system based on these measures. On days when I have nothing else to be cranky about, I sometimes fuss at how business-to-business software vendors hijacked the term “marketing automation” despite its long and relatively honorable history describing systems for consumer marketing. Oracle’s recent agreement to purchase Eloqua reinflamed that wound, since much of the commentary ignored Oracle’s extensive existing suite of consumer marketing systems. More productively, the deal also shifted discussion from components within a marketing suite to where marketing systems fit within the larger world of unified customer management. This perspective has always been part of consumer marketing, where the classic description of Customer Relationship Management (CRM) was “marketing, sales and service”. That formula fell out of favor when the most prominent CRM system became B2B-oriented Salesforce.com, whose very name reflects its origins in B2B sales automation. One reason that B2B perspectives have dominated the recent discussion of marketing automation is that the major B2C marketing automation products have receded from view after being absorbed by larger corporate platforms: Unica is part of IBM, Aprimo is owned by Teradata, Portrait Software is owned by Pitney Bowes, Epiphany is owned by Infor (which last month acquired marketing resource management leader Orbis Global, a bit of news I'd missed), Alterian is owned by SDL, and SAS is owned by, well, SAS. This diminishes most products’ independent profiles (Aprimo is the exception), although they are still selling nicely. Even some of the less prominent B2C products have been acquired recently: Conversen by Experian and Entiera by FICO, although neither of these are enterprise software vendors. The net result of all this harvesting by big buyers has been to clear the ground for the next crop of B2C marketing automation systems. These fill a demand for powerful but moderately-priced options by both marketing services providers and mid-sized companies. Those buyers often find that systems from big enterprise software vendors become too expensive or require too many ancillary components from their corporate parents. One vendor taking advantage of this opening is RedPoint. Founded in 2006 by veteran CRM consultants and technologists from Accenture, the firm has created an exceptionally extensive marketing automation product including not just campaigns and content management, but also database maintenance, which isn't usually part of marketing automation. Although IBM, SAS, and Pitney Bowes provide a similar scope, RedPoint is unique in having built all those components itself and keeping them tightly integrated. The data features are especially impressive. RedPoint offers a rich set of standard data management features including loads from files, databases, and semi-structured formats like XML and EDI; transformations including regular expressions, file splits, and table joins; batch and on-demand process flows. There's also a novel option to use Web service calls for on-demand data appending, a particularly noteworthy concept. Beyond those, the system provides specialized functions to manage customer data including name/address parsing, standardization, and matching. Users can apply the system's built-in rules for these or modify the rules to meet their own preferences. All data functions are managed with a sophisticated workflow engine that allows fast development of new marketing databases -- often in a matter of weeks, not months. This removes (or at least shrinks) the single greatest obstacle facing many new marketing systems. The system was also designed to scale. It can work with standard files and SQL databases, with native connectors for SQL Server, Netezza, Oracle, and Teradata. Support for Hadoop, Hbase, PIG, Hive, Cassandra, GreenPlum and other “big data” technologies is due early this year. Clustering is available at all application service layers and the system supports true multi-tenancy (multiple instances running on the same installation). Campaign management features are equally deep although less unusual. 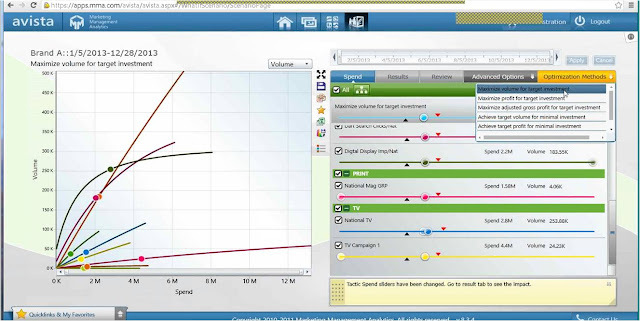 A drag-and-drop flow builder allows complex, rule-based branches and can react to behaviors during the campaign. Users can define audiences with batch selections, scheduled processes, and “subscription groups” of anonymous individuals (such as Web site visitors) who match specified behavior profiles. Splits can be based on logical conditions, random selections, or auto-generated cells with all possible combinations of specified variables. The auto-generation feature, which can easily produce segmentations with hundreds or thousands of cells, is a hallmark of sophisticated B2C marketing automation systems. It is used for segmentations such as RFM (recency, frequency, monetary value) cells, age/gender/cluster cells, branch or dealer assignments, and product splits. RedPoint also provides self-training predictive models. These are currently used within the data management functions and matching algorithms. They will be soon applied to select offers for Web personalization. Content management includes an editor to create outputs for email, Web, SMS, Twitter, Facebook, FourSquare, LinkedIn and other formats. Users can build shared templates that are later modified for individual projects. Objects can contain Web forms and dynamic content blocks driven by selection rules or mapped to audience segments. The system can generate Web tags to capture user behaviors and can react to those behaviors in real time. It manages approval workflows, version tracking, and precise control over which users can access different objects and functions. Pricing for RedPoint is based on a combination of deployment services, software licenses, and hosting fees. A minimum system starts around $60,000 per year. There are more than 100 installations, about half sold directly and half through partners such as marketing service providers. The system can be hosted by RedPoint, by a service partner, or by the client.